I’m super excited and I haven’t been for a while…. Disney’s “Frozen” is set to hit theaters on November 27, 2013 but today Disney Animation just released the official trailer. “Frozen” features two princesses– The younger sister is Anna (voiced by Kristen Bell) she is spirited and funny but doesn’t have any magical abilities and her older sister, Elsa (voiced by Idina Menzel) on the other hand does and she controls snow and ice, Elsa wants to make everything icy, and Anna must convince her to stop and save their kingdom of Arendelle from becoming well…Frozen. The original “Snow Queen” by Hans Christian Andersen is about a little girl who sets out on a journey to find her best friend Kai, after the boy is kidnapped by the evil Snow Queen. Therefore, it’s safe to say that Disney is just using Andersen’s story as its foundation, and creating a whole new magical story with additional characters like the comical snowman. Anderson is still credited as a writer of “Frozen”. “Frozen” will be directed by Chris Buck, who directed “Tarzan”. Produced by Peter Del Vecho known for “The Princess and the Frog”. This is one movie I’m definitely going to the theaters to see. 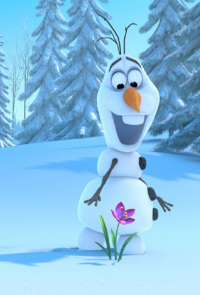 PRODUCT PREDICTION: A plushy of the snowman Olaf… great for Christmas time! This entry was posted in Disney News, Entertainment and tagged 2013, anna, disney, elsa, frozen, movie, november, Princess, thanksgiving by JNYFAV. Bookmark the permalink. I can’t wait to see this! Thank you for sharing the trailer. It looks fantastic! cakes. Of course manga style is strongly related to Japan, but it appears to be extremely well-known in various regions. return from work and not cost you anything.